Have you heard that the recovery is slow because of logistics, or money, or the scale of devastation? That certainly may be true. Or it may not. Deepa Panchang reported how some humanitarian actors in Haiti failed to meet the basic needs of earthquake survivors because they either did not know about, or were not willing to apply, clean water and sanitation protocols set forth in what’s called The Sphere Handbook. They said Sphere standards did not apply in earthquake ravaged Haiti. They were wrong, because Sphere standards apply in every disaster. They said Sphere standards didn’t matter because they were providing enough water and latrines to meet the needs of people living in displacement camps. But Sphere articulates “minimum standards” not “maximum objectives,” and is the authoritative statement on what is required to protect the life and dignity of disaster survivors. The failure to follow Sphere standards in Haiti contributed to the ongoing cholera epidemic that has thus far killed nearly 9,000 people, and sickened more than 750,000. 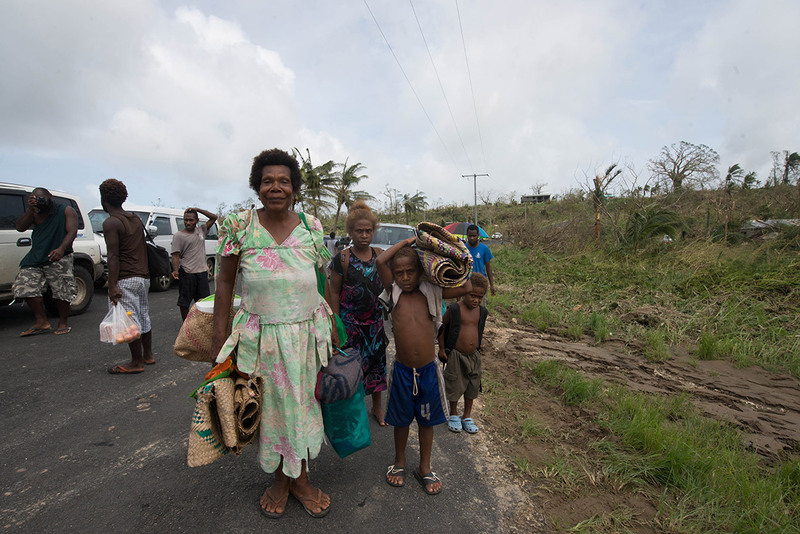 Vanuatu is now the focus, and we are reading about problems you are experiencing with aid distribution and shelter conditions. See examples here, here, and here. But experience tells me there are not enough (if any) human rights lawyers on the ground who can advocate on your behalf, or who can provide resources and training that will empower you to do so for yourself. Right now, you may in fact feel very disempowered. The resources below, however, give you some leverage. The excerpts are taken from two sources: (1) The Inter-Agency Standing Committee Guidelines for Gender-Based Violence Interventions in Humanitarian Settings, and (2) The Sphere Handbook. They are just a sample of the many protocols designed to protect what’s generally referred to as the “human rights of internally displaced people.” These excerpts relate specifically to shelter protocols, though both documents cover the broader range of disaster-related human rights issues. They will be useful if you are negotiating with shelter managers or humanitarian actors for safe and secure living arrangements that you deserve, and are entitled to under law. Key Action 2: Select sites with sufficient space that do not pose additional security and protection risks, considering proximity to high-risk areas and fuel/water/aid distribution and collection sites. Key Action 3: Put women on shelter committees, ensure their participation, and that their needs are met. Key Action 4: Locate shelters in areas that promote a sense of community and reinforce community-based protection, while also preserving family privacy. Provide a common area for children to play where caretakers can watch them. Implement safe water and sanitation programs, and provide lighting in communal areas and for individual use. Key Action 5: Designate safe spaces for women, children and other vulnerable populations. Allow confidential, private and anonymous access to sexual violence services. Consult, consult, consult with women, and mobilize them to manage safe spaces and activities. Consult some more. Key Action 6: Maximize safety and prevent sexual violence in communal shelters. Provide partitions between families; accommodate single women and single men in separate communal booths; consult, consult, consult with women to meet their needs; and regularly monitor shelters for security and protection. Key Action 7: Do not compromise protection. For example, “a separate location for single female shelters may in some cases be protective while in other cases it may instead expose them to harm.” Establish clear, consistent, and transparent systems for shelter allocation, material distribution, and criteria for qualifying for shelter assistance. Guidance Note 3: calls for “additional facilities or access points to meet the needs of the targeted population, and in particular, vulnerable people,” taking into account “the existing social structure, and gender roles of the affected population and the requirements of vulnerable people, [such as] ensuring services are within reasonable walking distance for individuals with mobility difficulties and the provision of safe breastfeeding areas in temporary communal settlements.” (Note the UN report on breastfeeding concerns linked above). Covered living space must ensure privacy, safety, and health, and enable people to undertake essential household and livelihood activities. Guidance Note 3: covered areas should accommodate “local practices,” for example, “sleeping arrangements and care for extended family members. Consultation should include members of vulnerable groups [and their care takers].” Internal subdivisions within individual household shelters should be offered. In communal shelters, “the grouping of related families, well-planned access routes through the covered area and materials to screen personal and household spaces can aid the provision of adequate personal privacy and safety.” All shelters should minimize overcrowding and maximize adequate space and privacy.